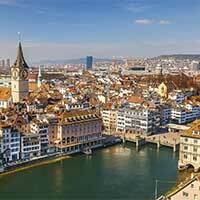 Looking for a cheap ticket to Zurich? Here you can search all major low-cost airlines for cheap flights to Zürich Airport (ZRH). The Zürich Airport is located 15km from the Zurich city center. A taxi from Zürich Airport to Zurich center would cost CHF 60.00. Before you book a flight you can use Utiket to find the cheapest flights to Zurich for Lufthansa (LH), Swiss International Air Lines (LX), British Airways (BA), Air Berlin (AB), Eurowings (EW). All flight data are real-time and accurate. Follow the links to search and book your cheap ticket to Zurich directly with the airline or one of our partnering travel agents. The Zürich Airport or also known as Kloten Airport is with over 25 million passengers a year the largest airport of Switzerland. Zürich Airport opened after World War II, in 1946 and within a decade the airport had to expand already because of the quick increase of flights and passengers. Growth continued until the crisis at Swissair which had to ground all its flights due to cash-flow crisis after the September 11, 2001 attacks. Zürich Airport lost a lot of traffic with only gradually began to return after the take-over and restart of Swissair by Lufthansa as Swiss International Air Lines in 2005. The Airport got another blow in 2015 when Etihad Regional decided to cancel most its flights from Zürich. Read more about Zürich Airport. This is a list of all airlines flying to and from Zurich and how many flights and destinations they serve. You can see a complete list of airlines and flight options to Zurich. Need place to stay in Zurich?